Kyuuemon gives life to Ninja Hayabusa whom he wants to fight as an Izayoi Style Ninja to gather fear from children. 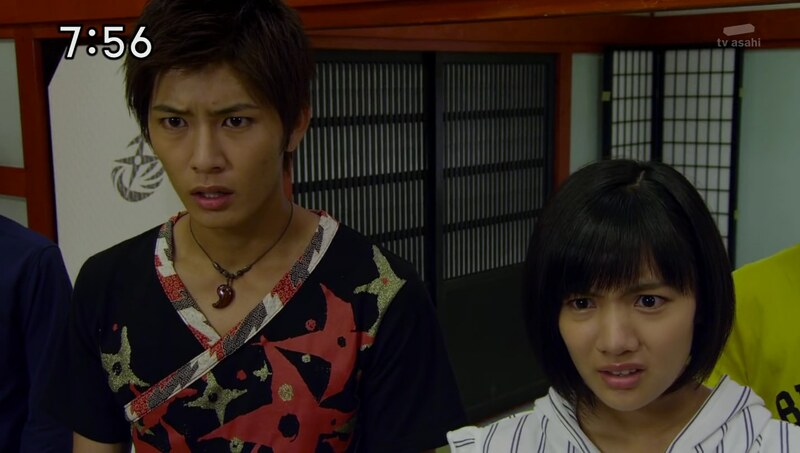 At the dojomanse, Takaharu feels good waking up early today and helps Kasumi and Fuuka sweep out front. Fuuka greets Hiroshi, a little boy that’s just moved into the neighborhood. But he isn’t too friendly to them because he thinks ninjas are lame. Hiroshi gets onto the school bus and sticks his tongue out at Takaharu before leaving. Hiroshi’s mom apologizes. He used to love ninjas, but stopped when other kids teased him for it. The mom realizes she forgot to give Hiroshi his lunch, so Takaharu and Kasumi offer to bring it to him. But when they get to the school, they find some kind of strange barrier. They henge and try to break through, but their ninja techniques don’t work. That’s when Hayabusa introduces himself and challenges them to break his ninpou. The Ninningers meet up to figure out how to get into the school since it appears adults are blocked. Yakumo has an idea. He will turn them all into toys. Fuuka becomes a dog. Nagi is a dump truck. Kinji is a guitar. Kasumi is a doll. Takaharu is an Akaninger action figure. And Yakumo makes himself a dragon. Since they’re not adults anymore, they are able to pass through the force field. They hop to the playground, but Kasumi warns them not to get too close to the kids. Oops. Since they have to wait for the spell to wear off, they have now become the kids’ targets. They go crazy for the dog, dump truck, doll and guitar. 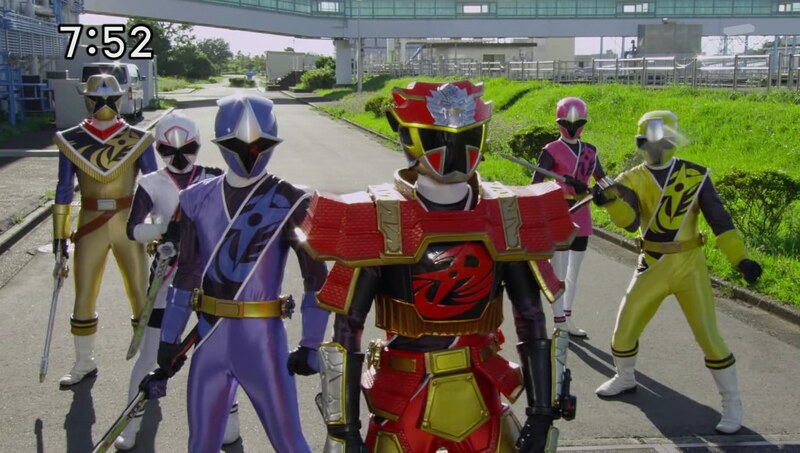 But it is Hiroshi who takes Takaharu while Dragon Yakumo is left behind. Hiroshi writes his name on Takaharu’s back and stuffs him into his backpack. 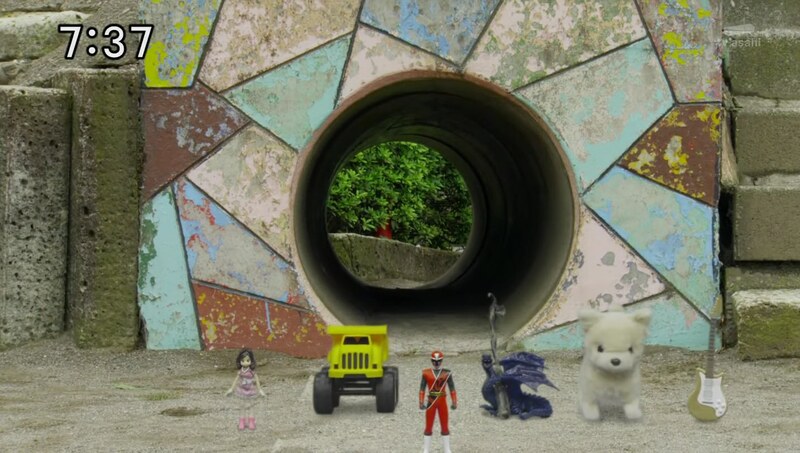 Fuuka, Nagi, Kasumi and Kinji are able to escape and make their way through the playground before they are back to their normal selves. That’s when they find the teachers are actually Jukkarage. They henge and fight them off. But Hayabusa appears and summons Izayoi kitsune-looking Supparage! Kasumi blocks an Izayoi fire technique from him and tells Nagi and Fuuka to evacuate the children. They see the school bus and decide to pose as PE teachers to get the kids in without scaring them. The bus drives safely out of the school. 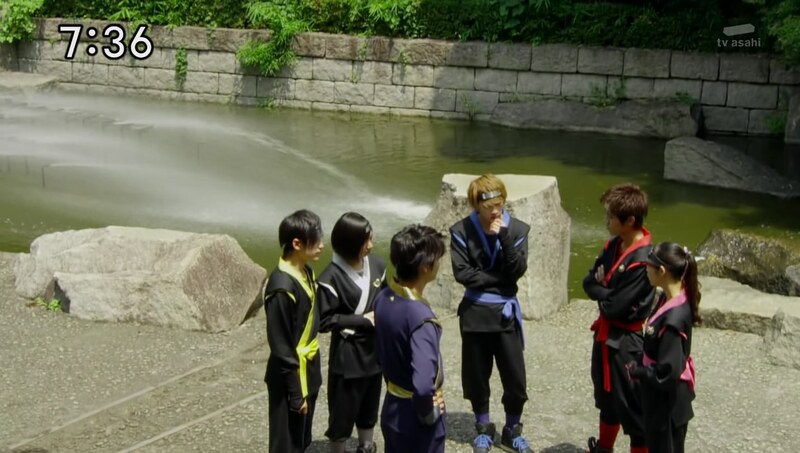 Fuuka and Nagi rejoin Kasumi and Kinji and they take care of the Supparage. But Kasumi feels something is off. Indeed. Hayabusa explains that the real plan was to gather fear from the kids by getting them into a bus and scaring them. The bus driver is actually Supparage who begins to swerve the bus dangerously on the road. The force field was just to lure the Ninningers to the school. On the bus, the spell has worn off Takaharu and he falls out of Hiroshi’s bag. Realizing what is going on, Takaharu knocks the Supparage out. But the brakes on the bus don’t work! Kasumi asks Hayabusa how to stop the bus. Like he’d just come out and tell them. Kasumi leaves it to Yakumo whose spell has just worn off. He casts a new truth spell that forces Hayabusa to explain a shuriken on the bus’ accelerator is controlling it. Yakumo henges and hops into Dragomaru to catch the bus. He tells Takaharu to take the shuriken out and the bus immediately comes to a stop. The kids see Hiroshi’s name on Takaharu’s back and they think that’s so cool. 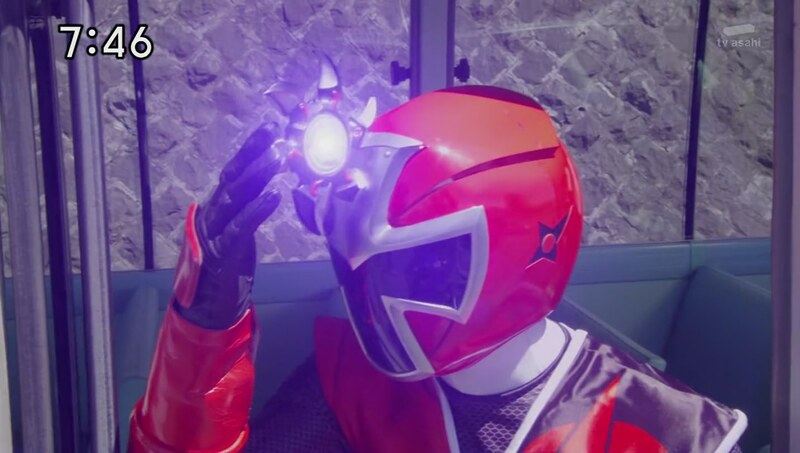 But the shuriken attaches to Takaharu’s helmet, causing him to uncontrollably speed off this time. Yakumo follows and protects him from hurting himself. The others have trouble dealing with Hayabusa. Kasumi hears something approaching. She leads Hayabusa into position just as Takaharu comes speeding at him from behind. 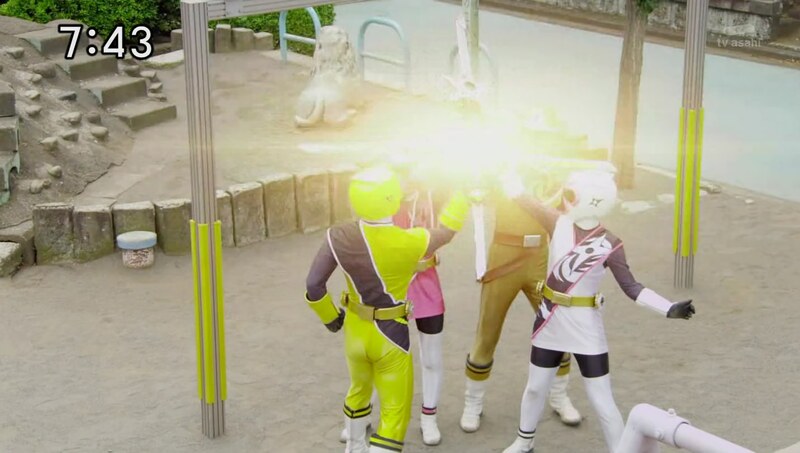 The shuriken becomes attached to Hayabusa and the Ninningers chase after him while doing a roll call. Takaharu goes Chozetsu and together they manage to finish off Hayabusa’s first life. Kyuuemon arrives and compliments on them becoming stronger since their last meeting. He just chuckles and says this is the beginning of the battle between the Igasaki style and Izayoi style of ninjutsu. Kyuuemon embiggens Hayabusa and the Ninningers hop into Lion Ha-Oh and King ShurikenJin. Hayabusa is ready to die to complete his mission, just as a ninja does. But the Ninningers easily finish Hayabusa off for good. Hiroshi wants to become a ninja student, but Takaharu says only when he becomes the Last Ninja. They head inside the dojomanse and Grandpa says Takaharu still has a long way to go to even consider taking on a student. This situation is very familiar to him. It is just like when he took Kyuuemon on as his own student. He too was as innocent as Hiroshi. But now, he’s a villain stained with darkness. And because of his failure as a teacher, Kyuuemon is now challenging them. For that, he apologizes. But the Ninningers say it’s okay because they are definitely not going to lose against him. Grandpa then drops the bomb that the source of the Izayoi style of shinobi power is the Igasaki style of nintality. To be more specific, it is the power he stole from Father. An interesting episode. It was a little all over the place. The whole Toy Story adventure was amusing at first, but felt more like filler at the end of it. Kyuuemon now summoning monster ninjas is kinda random. And I thought it was oddly funny that the kids stopped crying and stayed not even calm, but just stoic while Takaharu took the wheel of the bus. But I guess the most interesting and more important part is Grandpa’s revelation that Kyuuemon stole Father’s nintality. I’ve been annoyed by Grandpa always keeping things secret until something happens that forces him to come clean. But I still enjoy that we’re learning more about Father and their family, especially when it relates to the overall plot. That is, Kyuuemon’s origin and how he turned to the dark side. 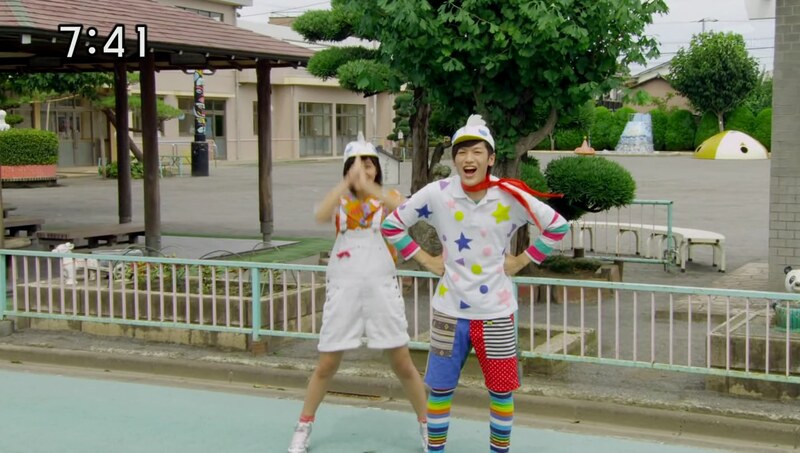 Everything else in the episode was typical Ninninger. But I hope that we get some big story and plot development in the coming episodes. 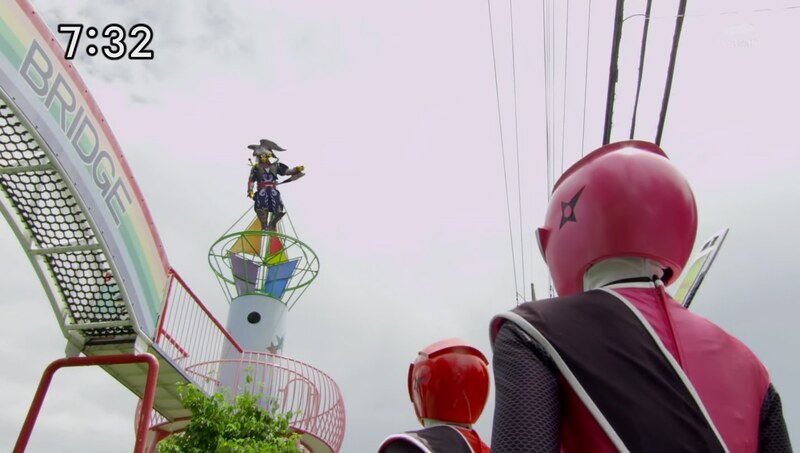 ← Recap: Kamen Rider Drive, Episode 45 – What Is the Roidmudes' Final Dream?